In terms of daily usage and usability, Apple iPhones are near perfect. For the people with average or lower than regular level of technical literacy, Apple devices still appear to be very easy to use. That’s the key point these devices e.g. Apple Mac, iPhone and iPad etc. sell like hotcakes. However, even though they appear to be perfect, there could be errors showing up during various system processes. iTunes error 17 is very common, especially while restoring an iPhone using iTunes. 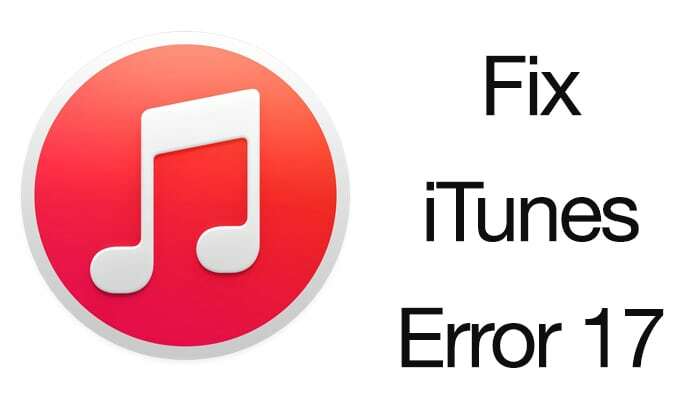 Read more to learn how to fix iTunes error 17 easily. There are plenty others bearing different iTunes error codes. They of course have some sort of proprietary explanation in Apple’s dictionary, but we won’t dig into those. This method isn’t as silly as it sounds. Restarting clears off many issues ongoing on a computer system, or even the iPhone you have because it’s a computing unit too. Restarting might not fix iTunes error 17 in a straight shot, but it’s worth giving a try. Error 17 is often incorporated with registries; or affected by some other ongoing operations on your computer which could be resolved by restarting both your iPhone and computer. On your iPhone press and hold down the power button and when the display blurs out, slide the button to the right to turn the phone off. Networking issues often cause the iTunes error 17, as iTunes can’t connect to Apple’s server for downloading the necessary restoration files. Date & time plays an important role for seamless connectivity on the internet, a computer with a wrong date will encounter errors even on the regular internet browser. Thus, change the date & time on both your iPhone and your computer. Older versions of iTunes would probably end up with errors while trying to restore a very latest iPhone. iPhone 6 may not get detected with all its necessary properties in an iTunes versions that was released back in the iPhone 4s days – that’s just an example of how this thing works. iTunes is a free program available on Apple website – there’s no reason to update it to the latest version! 4. Is the Security Software interrupting? A security program on your computer could be blocking the network ports required by Apple iTunes. Older versions of antivirus, or an improperly configured firewall program will certainly cause a negative effect on the network connectivity. If you have any of the above conditions – deactivate the security program while you perform the iPhone restoration or get the latest version of your program. Has your internet service provider (ISP) implied any restriction on specific port numbers or any specific server? Maybe iTunes can’t get past your ISP’s barriers to the Apple servers and resulting in an iTunes unknown error 17. If you have checked everything else, then asking your ISP regarding this issue could be a solution or connect to another network and try to restore your device again. Error 17 in iTunes is very annoying, but there are ways of getting past it. Just some patience and workarounds are all it takes. Did you managed to fix iTunes error 17? Tell us in the comments below!